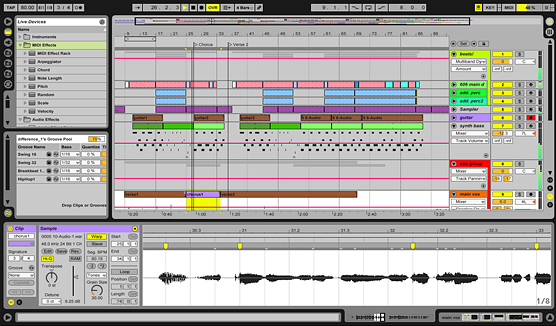 Ableton Live is an audio and music production program that gives users the ability to spontaneously compose, capture, remix, improvise and edit musical ideas - Live on their Macs (Ableton Live for Windows is here). Live allows users to mix in electronic, acoustic and virtual instruments, as well as digital audio recordings and samples, together in one intuitive interface. Users can then focus more on music instead of the gears. Ableton Live Demo is also available for download, it allows for a 30 day trial that users can use as long as they have internet connection. Ableton Live's simplified interface allows users to focus on inspiration and creativity instead of focusing on setting up gear for performance or recording. Users can capture and cut samples on the fly, mix and match audio with differing tempo, and audio effects, all while the music is playing Live. The whole music making process happens in real time. The latest version of Live, includes revamped warping, reworked MIDI editor, a new groove engine, live looping, new effects and crossfades in the Arrangement View. Bugfix for when running as a ReWire slave, Live would not stream audio to the ReWire master anymore. Reduced CPU spikes caused by external MIDI inputs on OSX. Improved the reliability and priority of the audio thread when using ASIO drivers. Improved the performance of Ableton Devices on Windows. Bugfix for device selection freezing when using Control Surfaces based on User Remote Scripts. Bugfix for crash if Simpler contained a very long audio file. Rolled back the Complex and Complex Pro Warp algorithms to avoid audio artefacts under some circumstances. Live would crash when performing 'Undo' after dragging a sample onto Simpler's breakout view. Reversing an audio Clip twice before the sample analysis completed caused the sample to be greyed out. Added control surface support for the Akai MIDImix. Added control surface support for the Akai Professional MPD218, MPD226 and MPD232 controllers. Added control surface support for the Akai Professional Advance keyboard series. Fixed crash on 64-bit systems when scanning VST plugins after changing the input device or opening a VST plug-in window. Fixed crash when dragging a Clip in the Groove Pool. Fixed Audio Units bug where it stops passing audio after changing sample rate. Replaced icon for current project in browser sidebar. Bugfix for Saturator and Dynamic Tube reporting wrong latency values when operating in High Quality / Oversampling mode, thus would not correctly be compensated. Bugfix for Redux reporting wrong latency values when in Soft mode, thus would not correctly be compensated. Device latency display on status bar when hovering over the title bar with the mouse. No latencies are shown when latency compensation is turned off. Automation and Modulation for Beat Repeat's mixer parameters (e.g Mix Type, Volume, Filter, Frequency, etc) and Device On are now compensated. Updated the pixel font (used primarily in device LCDs like Operator) for retina displays. Bugfix for crash which might occur when importing audio files with sample rates lower than 44.1KHz. Bugfix for bug where the mouse cursor would stay in stopwatch or beachball mode until the user physically moved the mouse. Bugfix for glitch where the modulated value would become visible as an orange dot while dragging a slider, even if no modulation exists. Added control surface support for M-Audio Oxygen 4th generation controllers. Max application chooser in Live’s ‘File Folder' preferences pane now compatible with the folder structure of Max 7 application bundles. OS X native full screen support now requires to have the option "Displays have separate Spaces" enabled in OS X' Mission Control system preferences. Bugfix for VST plug-ins that have MIDI output not outputing a CC 123 MIDI message ("All Notes Off"). Minor improvement for compatibility with Mac OS X' Gatekeeper for the forthcoming OS X updates 10.9.5 and 10.10. Bugfix for the [live.thisdevice] Max for Live object when adding/removing control surface scripts in the Live preferences. Enhanced threshold for inverting text colour of clip names, chains, macros, etc. depending on the background color, for better readability. Bugfix for MIDI level indicator not showing any activity inside the routing chooser of a MIDI track. Bugfix for Send button on the APC40 MKII not working when pressed for the first time. Bugfix for the Launchpad's Mixer mode not working after using the Launchpad's Session Zoom feature in Live sets containing more that 8 tracks. Bugfix for hanging when running as a ReWire Slave on Windows. Bugfix for crash when receiving an invalid MIDI note quantization value from a Max for Live device. Bugfixi for an issue which caused the Filter Type and its automation (if existing) to be set to an incorrect type after converting Simpler to Sampler or vice-versa. Bugfix for MIDI sustain messages and other CC# messages not being recorded reliably after the first loop iteration. Bugfix for enabling multiple tracks for recording and triggering the Session Record button from the APC40 MKII. Bugfix for "UAD bandwidth allocation exceeded" error while loading the set. Browsing effect presets would not work anymore after switching to Scales mode and then pressing the "Add Effect" button. Supports Novation Launch Control hardware. Supports Novation Launchkey Mini hardware. Now supports for M-Audio Axiom Air 25, 49 and 61 keyboards. Added Push to the "What's new in Live 9 lesson". Added Novation Launchkey and M-Audio Axiom AIR Mini 32 to the "Control Surface Reference" lesson. Added a new option to the "Record/Warp/Launch" preferences pane: "Start Transport with Record". Now records a latching automation envelope instead of jumping back to the previous value. Now supports Novation Launchkey series. Now supports M-Audio Axiom Air Mini 32. (8.3.3)Minor changes for usage data reporting. Bugfix for issue which could lead to degraded resolution of automation data when recording automation for VST plugins running in Novation's Automap shell. Bugfix for issue which prevented samples from being opened in an external sample editor. Bugfix for issue which could lead to two undo steps when freezing a track. Bugfix for issue which could cause the save dialogue to disappear in OS X Lion. Bugfix for login problems in the SoundCloud uploader on Windows. Bugfix for a rare crash which could occur with automatic updates on certain Windows computers. Bugfix for high CPU load when Receiving MIDI CCs on a MIDI track's input on OS X Lion. Bugfix for "Beats" warp mode which could lead to unwanted clicks in rare cases. MIDI sync was improved when Live is used as a MIDI clock slave. To prevent Live from crashing, users are prevented from choosing the Windows root folder for their plugins location. Tracks are now routed properly when imported. The Takeover default mode in MIDI Preferences is now set to Value Scaling and not Pick-up.